Current Position: 36 32.8 N 029 6.7 E Click to view map. I will not be taking you to the sunken city on this blog yet. 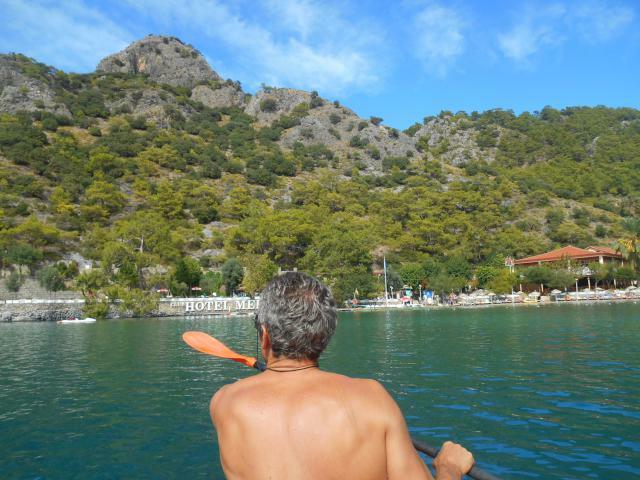 I have much to catch up after Dalyan river. 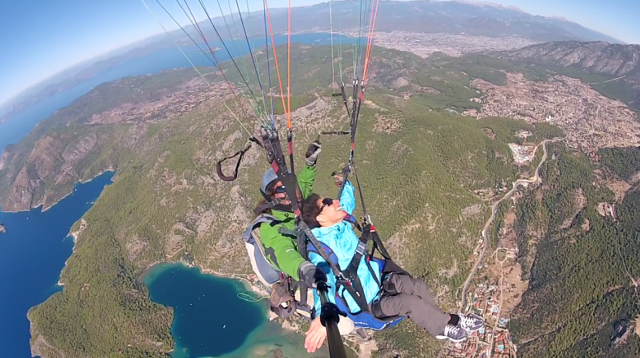 We left Dalyan on October 1st with some clouds on the sky, on a calm but expecting wind and some rain later. We had an early 6:30 am start because this day was quite a long stretch of over 30 miles. An hour later wind was starting to pick up and engines were off. 2 hours later we were sailing great with winds up to 23knots. One reef in. 2 hours later our reefing line broke due to chafe. Second reef in. 45 minutes later our second reefing line broke, due to chafe. Well…we are now down to the 3rd reef, which suits us just fine with winds up to 31 knots. We are beating up wind, reefing down and trying to have lunch, by now we also had big waves. 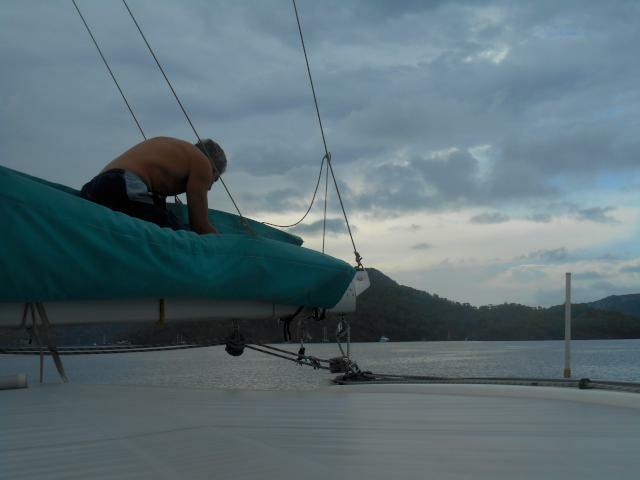 It was a fast sail and by 1:00pm we were just rounding the point getting in to the gulf on a beam reach. 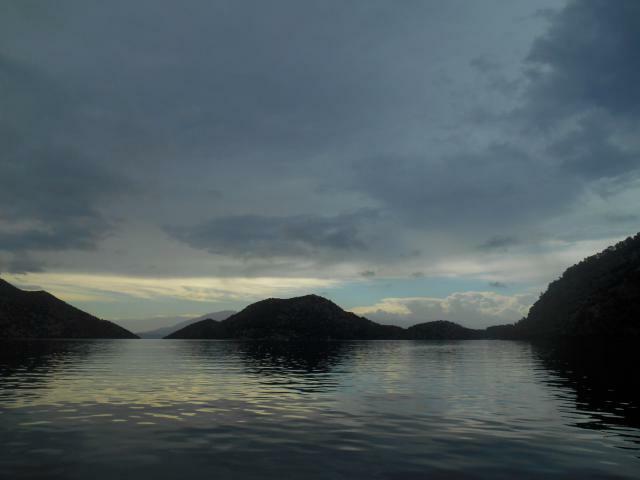 Here we turned to port and soon switched to motoring around looking for an anchorage and checking the depths. The waters around this area is are very deep. We arrived at this anchorage and anchored in 17metres deep. One Turkish guy from the gullet next to us immediately came and take our lines and tied them to the trees ashore. That was great help. At 2pm we were nicely anchored in this nice protected anchorage. Beautiful scenery all around. The clouds were getting darker and darker but the rain held out until the next day. 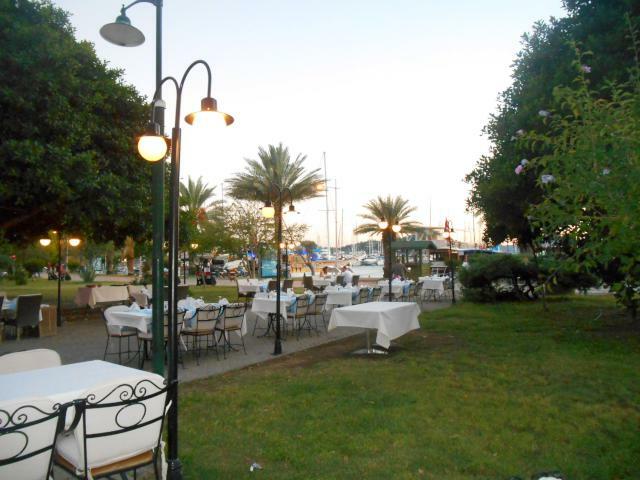 We had a peaceful night here, with just a restaurant ashore and very few boats around, was very quiet. 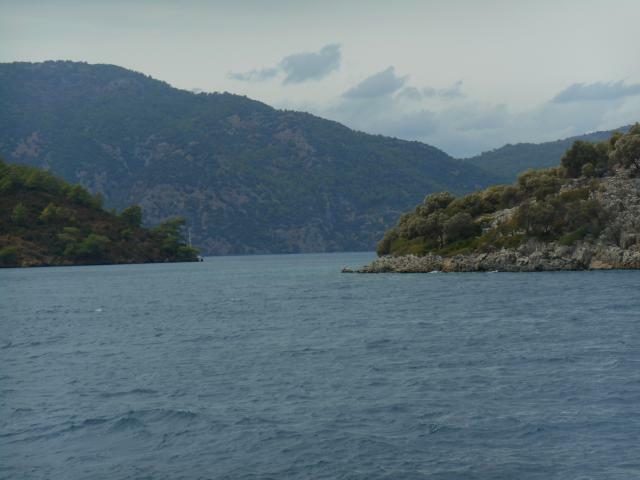 We set off motoring around and explore the area towards Gocek town. 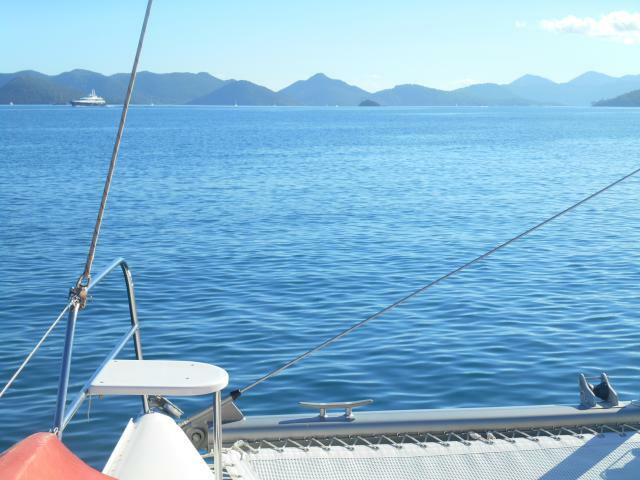 Beautiful scenery, great sailing area with many anchorages, you can spend a week or 2 just hoping around into a different spot every night. (If you’re prepared to anchor and tie up everytime) I guess that’s why is popular with charters boats as well as cruisers. As we’re heading up towards the town the clouds were coming in, no rain yet……. As we get to our anchorage just near this marina here, the wind and rain beat us to it. And the worse part was, that the waters were also very deep and the shallows were taken by other boats and we had to turn around and find somewhere else to go. Luckily about 5 minutes later we found this protected but small cove, not on our charts, but no one there and was only 12 meters deep. Great! Let’s drop it here. Didn’t even have to tie up, there was enough space for us to swing around. By this time we were soaked, but looking around and admiring this beautiful and peaceful spot, it was all worth it. We even had our own little private beach in the backyard. The next day we woke up to a beautiful sunny day again, as you can see above. I was so happy to be able to dry all the clothes from the day before. Looking ahead from our boat to the mouth of the Gulf. It is a very busy Gulf. There are about 3 marinas all close together. 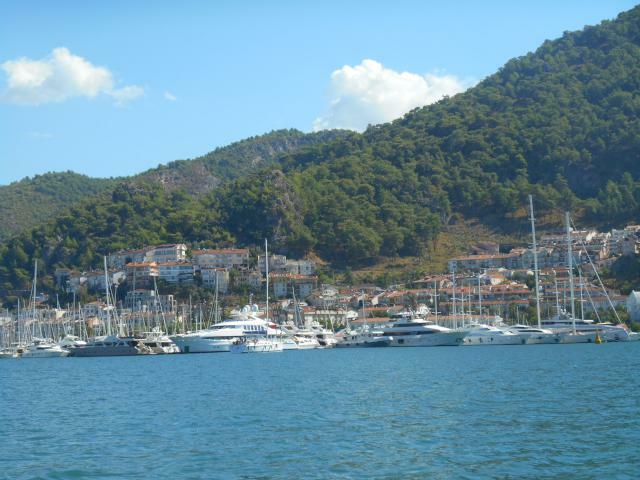 We took the dinghy ashore an visited the town of Gocek, small town in the district of Fethiye. Small fishing village but surprised to see so many supermarkets, good provisioning, and of course many tourist shops. 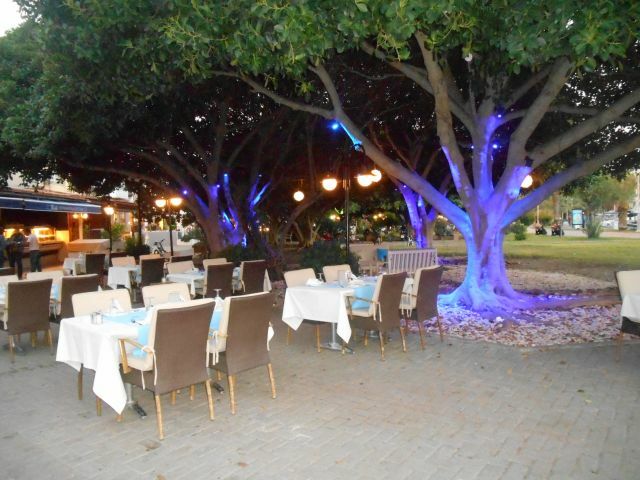 Very charming restaurants, with beautiful lighting in the evening throughout. 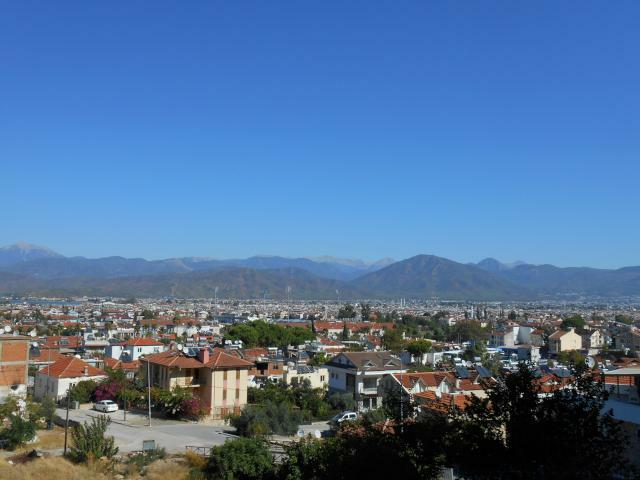 We stayed in the area for 3 days and moved on to the much bigger town of Fethiye, only about 10 miles away. 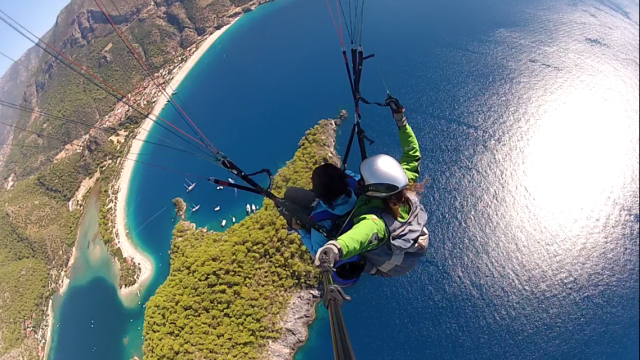 Fethiye just ahead. Again lots of traffic, coming and going. The first hour we had 15-19kts of wind and then it disappeared and we motored the last 45 minutes or so. 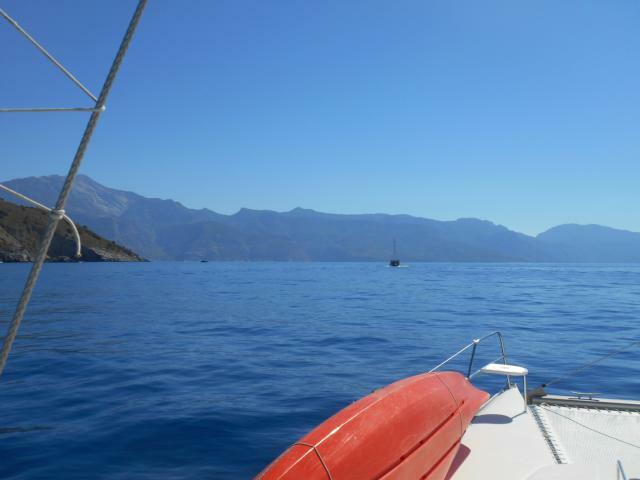 It a short beautiful sail to Fethiye, nice scenery and rock formations. This is just before getting around the point to one of the marinas in town. Sitting at the table doing splicing. So far we did about 5 of them. 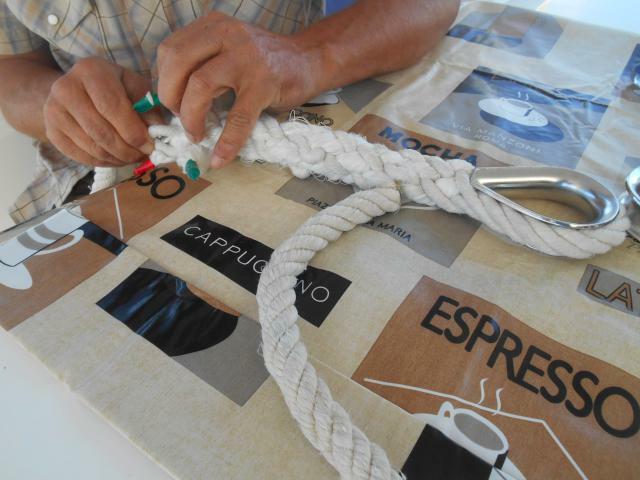 We bought extra lines to make a new bridal for the new parachute anchor so the ends need a thimble and splicing. Also new lines for the parachute anchor rode itself. This line was unusual – it had 4 strands instead of the usual 3. Noel also fixed our 400 watts inverter that decided to quit on us. Crucial for running the laptops! 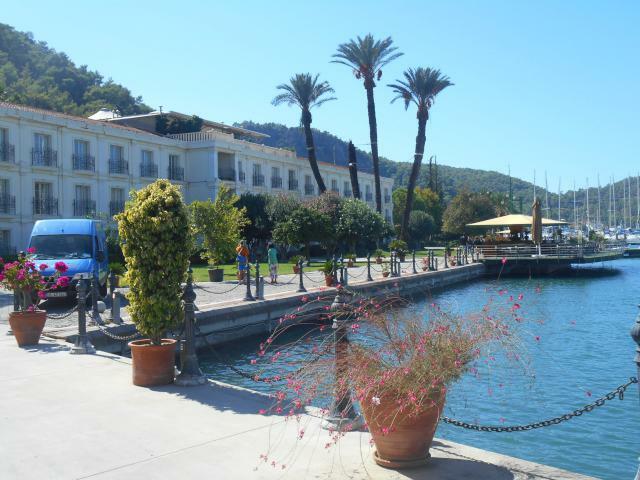 We are just turning around the point into a big bay in front of one of the marinas in Fethiye. We anchored right here in 12meters, mud bottom. Only a 2 minute dinghy ride and we were here in front of the marina, in front of 1 marina…they have a few surrounding the town. We had a good laugh walking along with this group of young guys, arriving at a yacht charter. I don’t know how long their holiday was going to be but they sure had a lot of luggage and they were laughing too struggling to move the buggy. It was a Saturday and was amazing to see still so many arriving for their holiday. The weather was cooler for a couple of days after the rain on Oct 1st, but then warmed up again to 27-30 degrees, water is still warm and we are enjoying our swims. 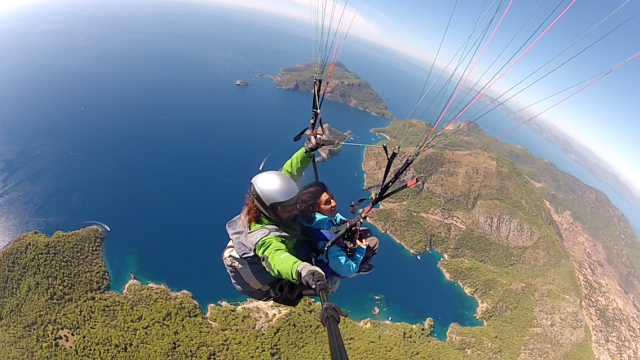 Welcome to Fethiye. Wow. It sure is tourist ville. It has this international feel to it. English and German dominate the town. British people everywhere, and some Germans and Dutch. 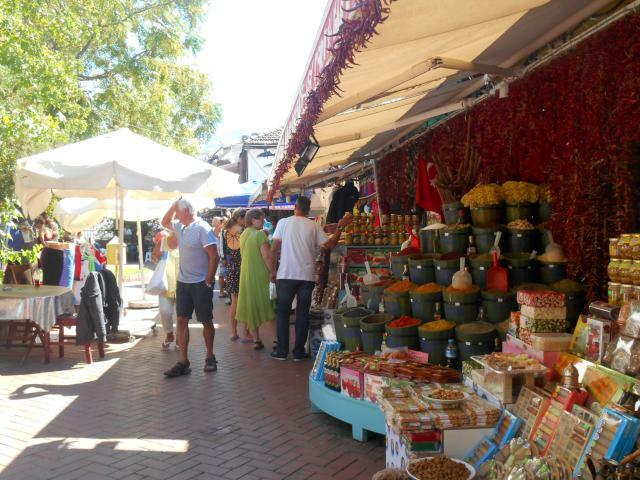 Very little Turkish, only the vendors! It sure was a delight when the young man told me I could pick any Turkish Delight I wanted. It sure was a delight. But before that, he asked me where I was from and I said Canada, but because they always want to know my roots I told him I was originally from Portugal. I was not so delighted when he started to speak to me in perfect Spanish. He was the second person on that day that did that. They actually think you speak Spanish in Portugal. ( just like they speak Greek in Turkey, right?) I still laughed about it. We really enjoyed the fish and meat market, the cobble stone narrow streets full of shops and restaurants all covered in bougainvillea and lots of greenery all around. 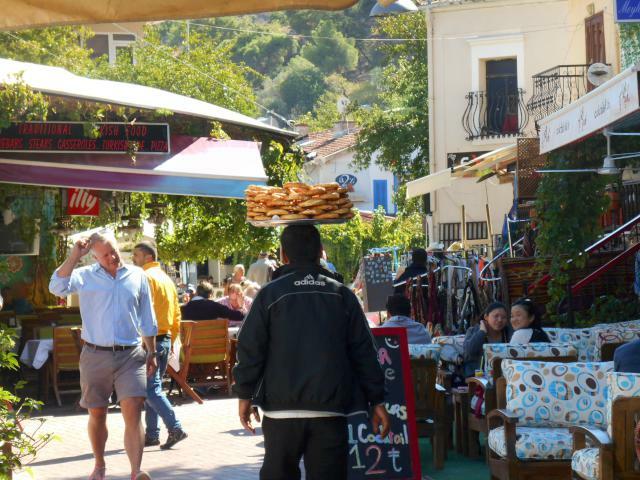 I love the way this man sells pretzels through the busy pedestrian streets. On one evening Noel and I had a really nice dinner in this very cute restaurant with a pond full of fish and fountain, great atmosphere, food and service. 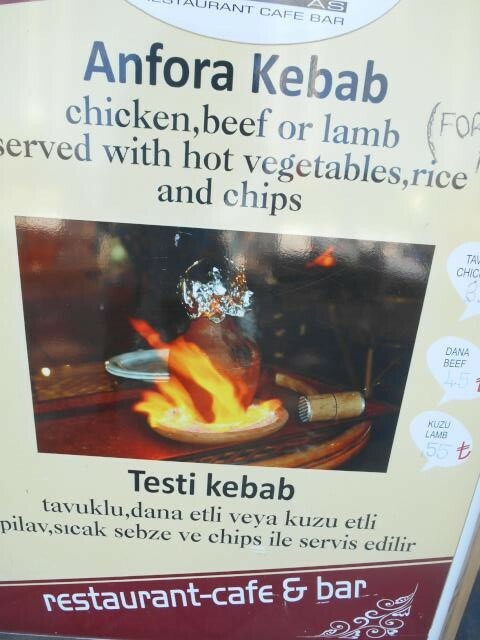 We had read that this restaurant served this traditional dish, called Testi Kabap. Picture bellow. I forgot my camera that night! It is a stew, choice of chicken or lamb. It is cooked in the oven inside this clay jar. The jars have a short life, they get broken at the table on this breaking point on the top before you scoop out you stew. The vent hole at the top is closed with dough which bakes into a piece of bread. The dish comes into table with small flames around it. 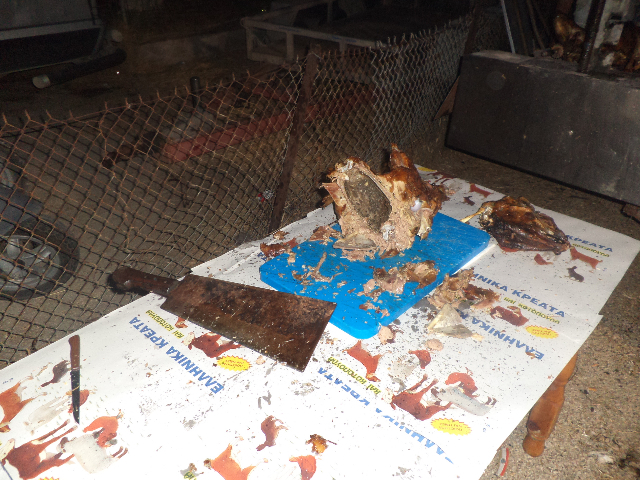 The stew was yummy, and the bread they served us……my mouth is watering now, it was the best bread ever. 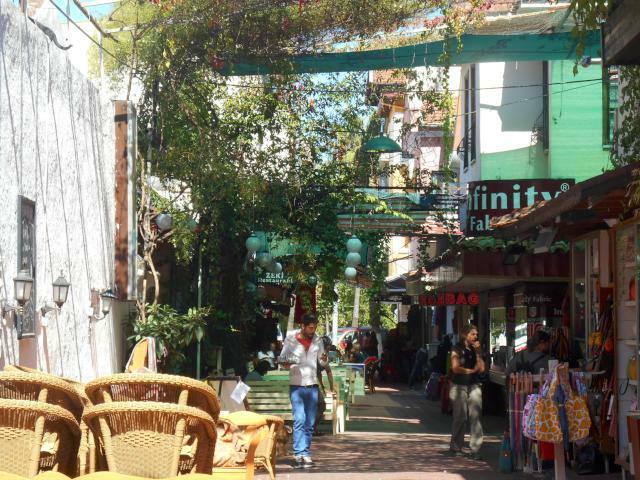 A walk through the beautiful town, away from the carpet sellers and tourist shopping ville. 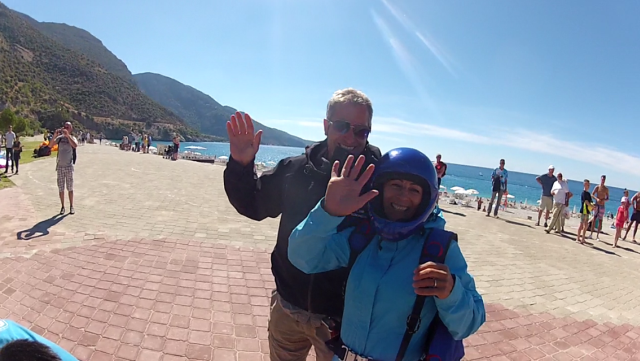 Fethiye has a population of about 40,ooo. Summers are hot, at 40 degrees. 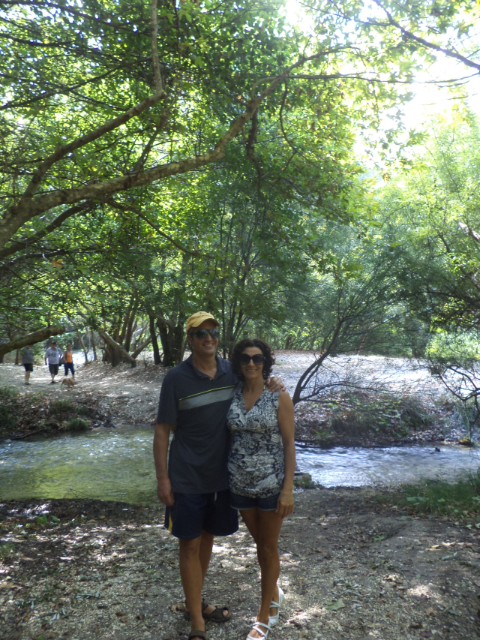 Lots of history, lots of hiking, shopping, provisioning, and it’s very green and beautiful all around. A walk through history. A short walk from the water front takes you to some sarcophagus right in the middle of town. This one across from the other 2, is right on the middle of the street. At night they had flood lights shining on it. 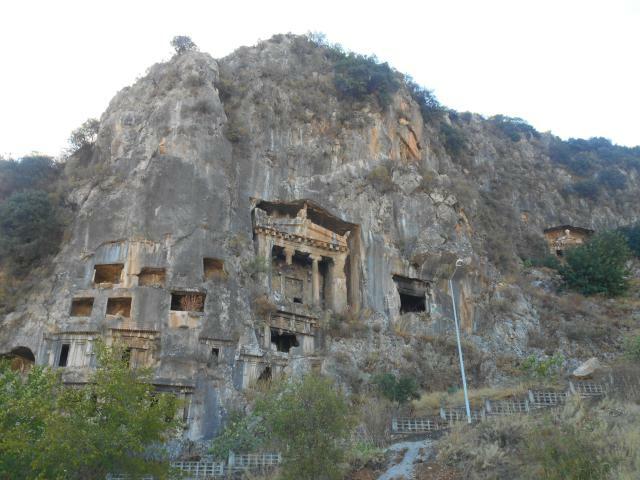 You turn around and look up into the hill and there are the Lycian rock tombs. 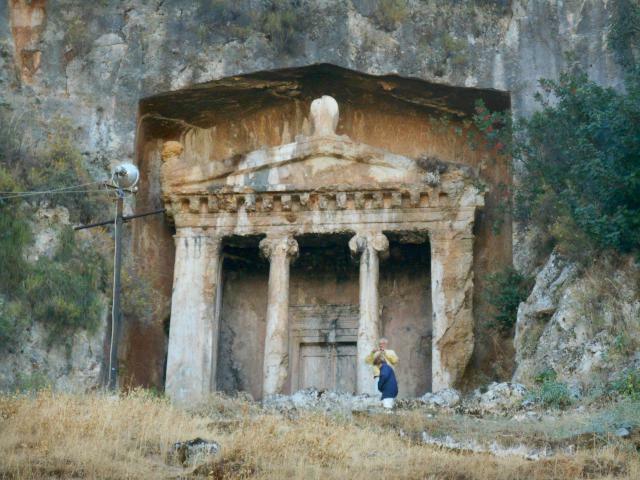 Noel and I peaked through this one that has a big hole, and we saw 3 shelves carved into the walls inside. 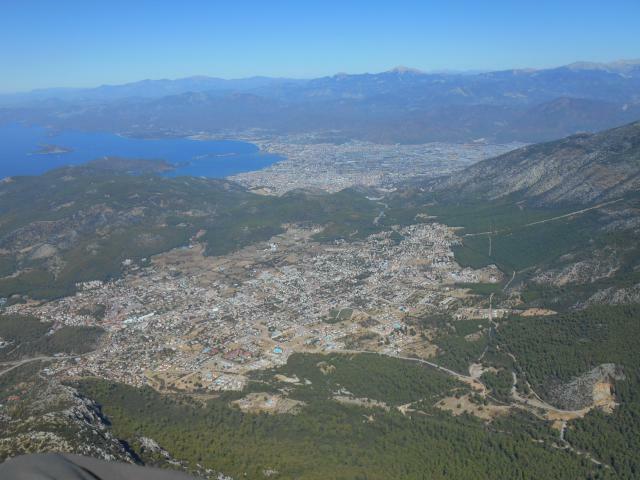 View of Fethiye from the rock tombs. We spent 2 days in the lovely town. I could see us spending a lot of time in this place. 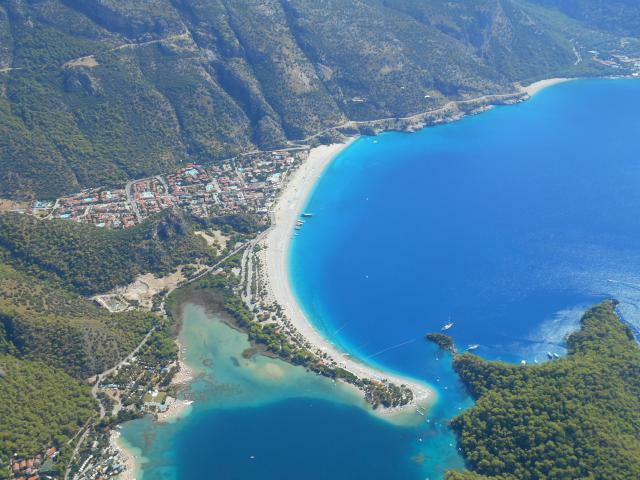 It is not only it has a nice feel to it, so many beautiful walks and hiking around here, shopping, beaches, historical places, Oludeniz and so much more only a short bus ride to everywhere. 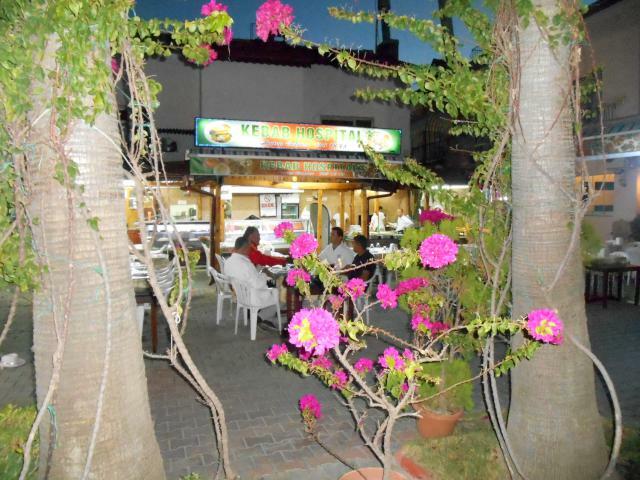 Plus you can still have a social life, not only in the marina but lots of English speaking outside the marina as well. 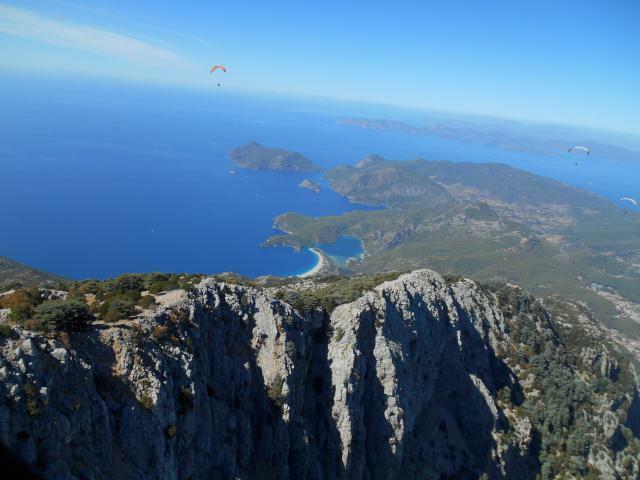 The famous 500 km Lycian way hike actually starts here in Fethiye. But we have to keep on going. 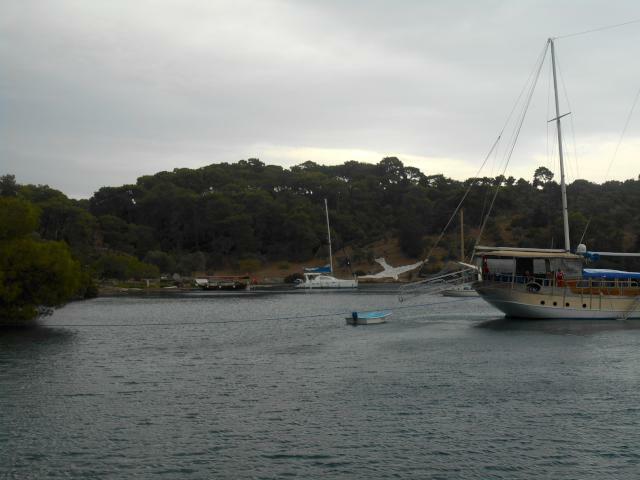 Plan to arrive in Finike at the marina around Oct 15. 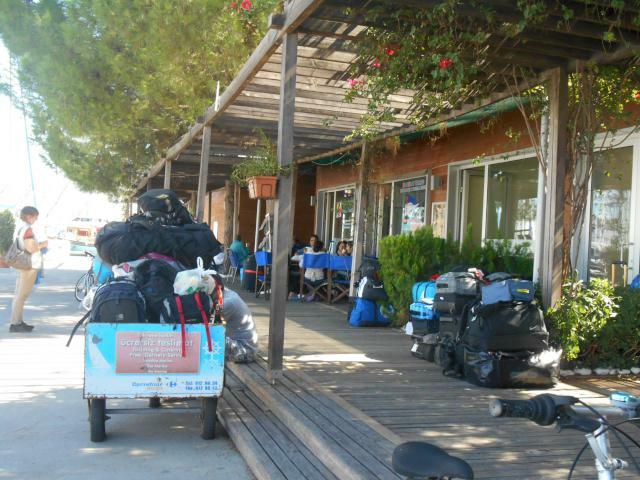 Sunday October 6th we were on our way to the next stop, in Oludiniz. 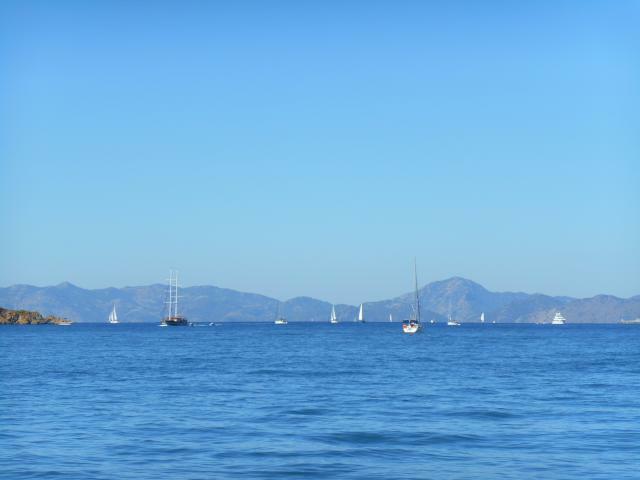 We had a quick start with 15kts of wind, but…..later died on us, and we motored the last hour. We arrived 3 hours later in this paradise. We were headed for the beach, but a guy on a little boat advised us not go there because of the many para gliders landing along there. 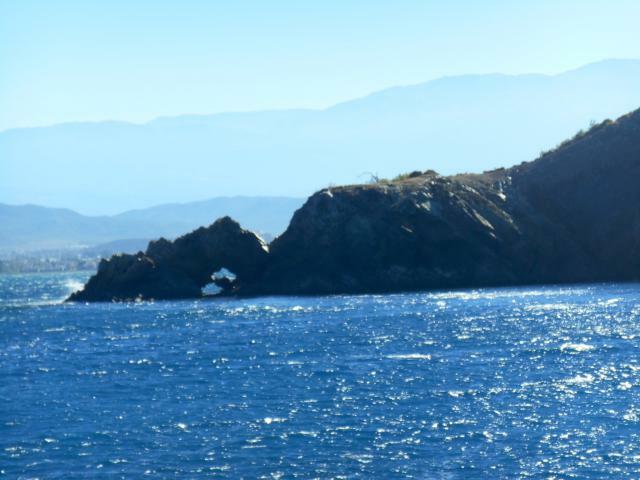 He pointed to us to follow him into this little cove and offered to take our lines ashore. 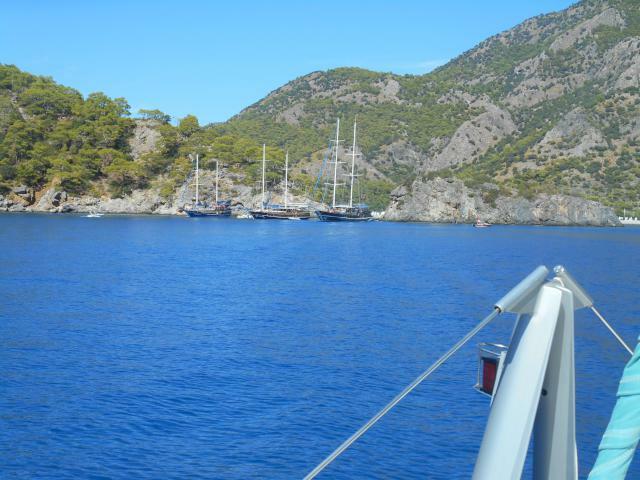 We turned to port and anchored in this nice cove just after these gullets, with amazing clear water and scenery. Better than being at the beach close to the tourist town. 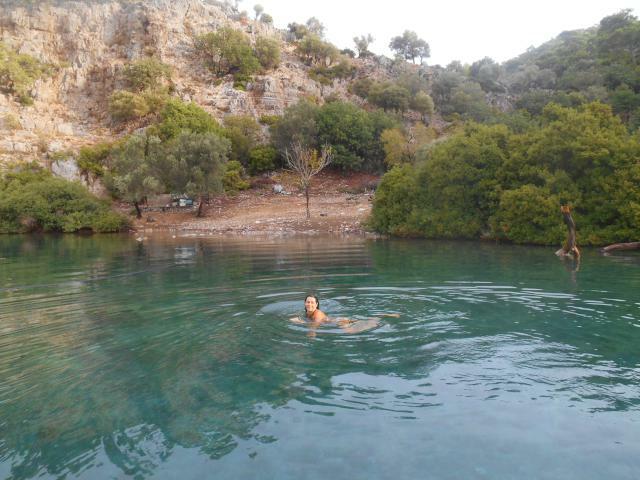 In the evening, the gullets left and we had this place for ourselves, in such popular area. Of course our man turned out to be the ice cream man and we had to buy an ice cream from him. Ok time to sit down and enjoy! A bit later we decide to kayak along the beach into the lagoon and do some exploring. At the end of the lagoon were some hotels and resorts, where we paid a visit to. 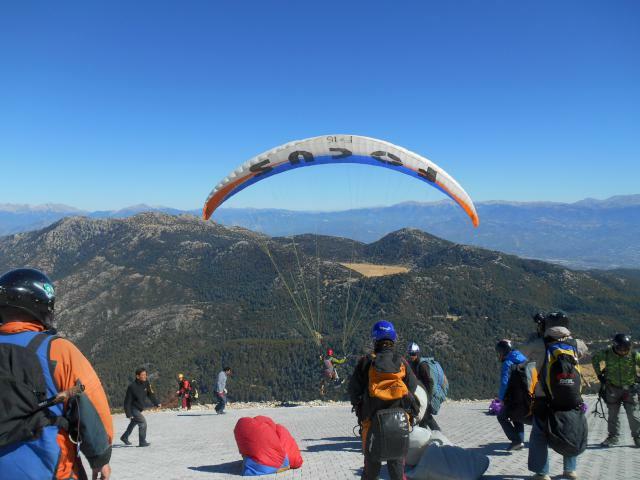 The area is popular for paragliding and after admiring the scenery and seeing photos we wanted to do it here. It is regarded as one of the best places in the world to due to its unique panoramic views, and Mount Babadag. We booked ourselves in for the next day. The Resort was very upscale,especially compared to the hotels in town. 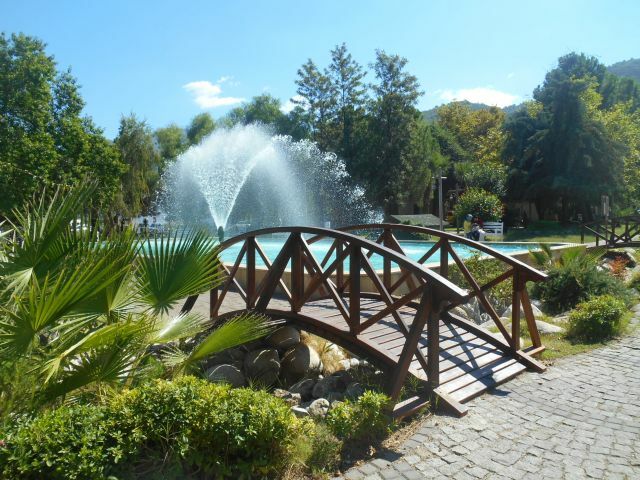 Beautiful gardens, views and in a peaceful area just far enough away from the town full of tourists. In front is paradise beach, nest to Nicholas beach and the furthest one is the strip of land between the sea and the lagoon. It has been such beautiful cruising down this coast! 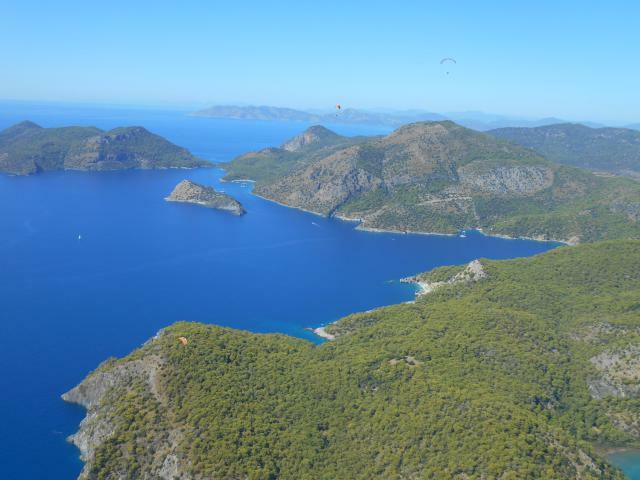 And then to arrive here in these tranquil turquoise waters sandy shores still some unspoiled beaches, picturesque ruins, towering cliffs para gliders above you everywhere…..wow! The next morning we kayaked to town. Left the kayak at the beach and headed to the para gliding office. Wow again. Welcome to England. 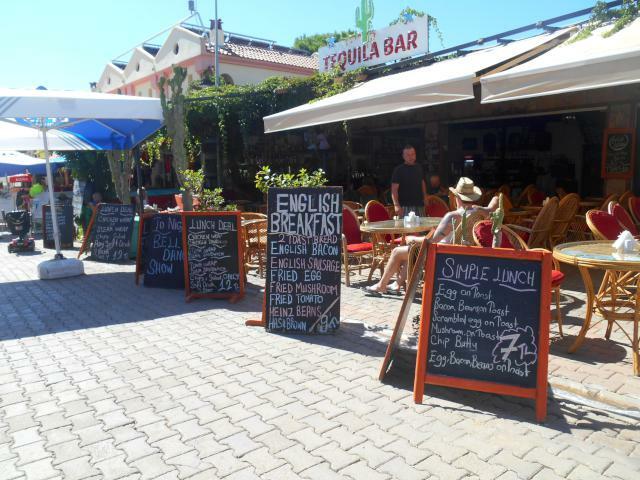 It was all British speaking, menus all in English and over-priced English breakfast for 12TL. 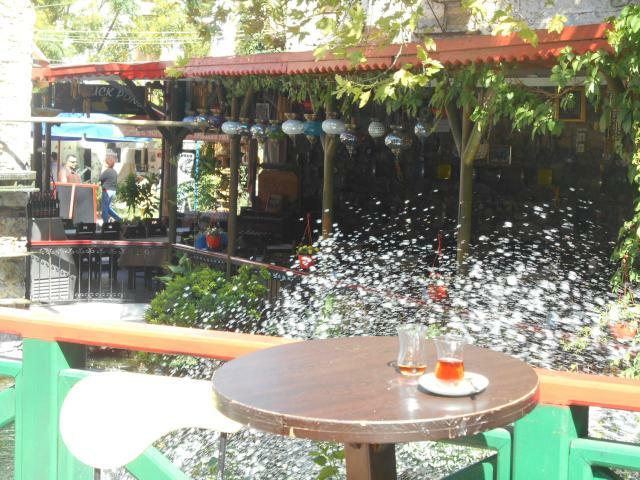 In Marmaris we paid less than half that price. 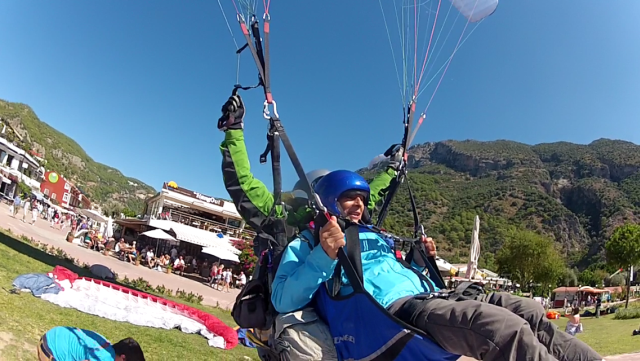 It was my first time paragliding. 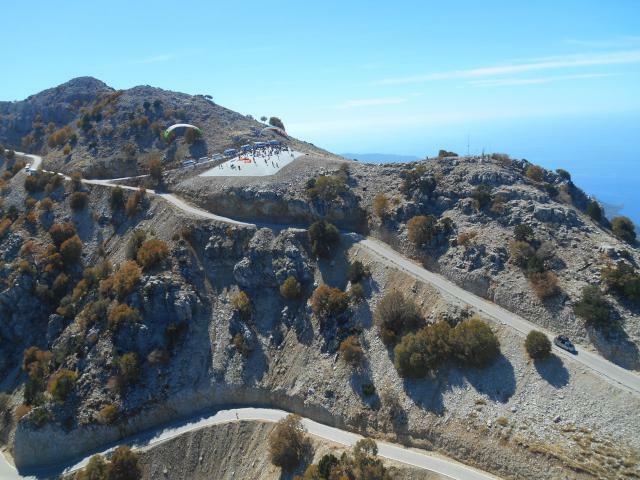 And after a 20 minute drive up Mount Babadag the very winding road we arrived at our launch area. 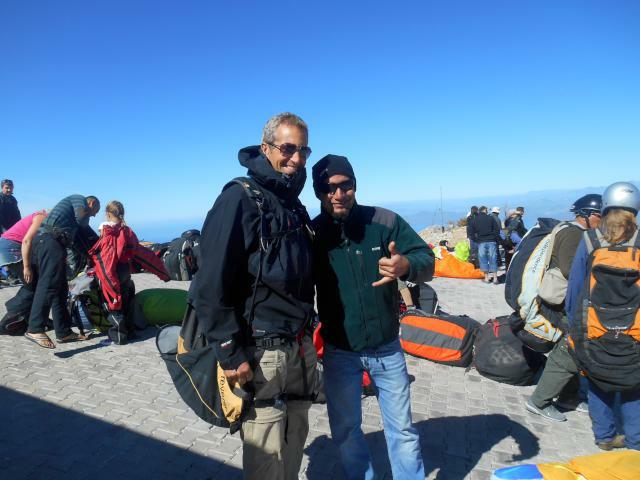 They have a 1700, 1800 and a 1900metres altitude . 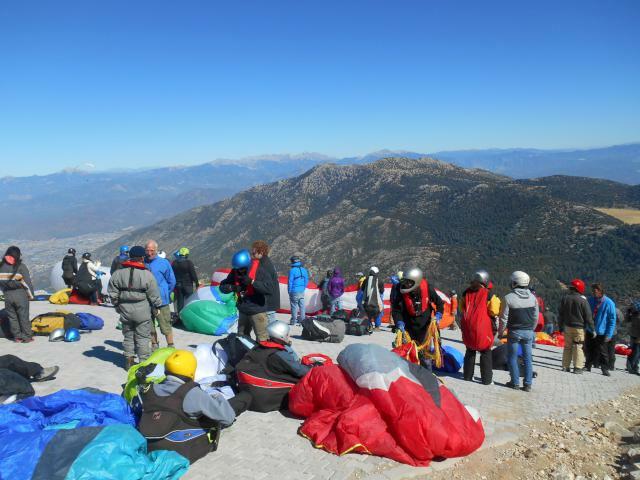 It was quite windy that day so we started from 1800m. Many people getting ready, waiting their turn and quickly putting on more layers of clothes. It was quite windy and cold at the very top, but half way down it warmed up. The sun was shinning and the views were incredible. The take off was actually very easy and smooth. I was felt very confident from the start, I immediately got my camera out and started taking photos, the one above is my first one where you can see the start. It was so cool!!! 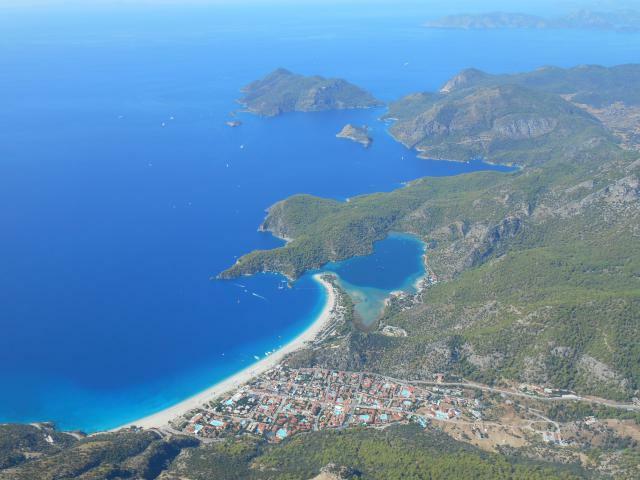 Hisaronu is an adjoining village high in the hills behind Oludiniz and surrounded by pine forests and beautiful countryside. The town at the far end is Fethyie, where we visit 2 days prior. It is only a short bus ride away. For us also a short sail down the coast. 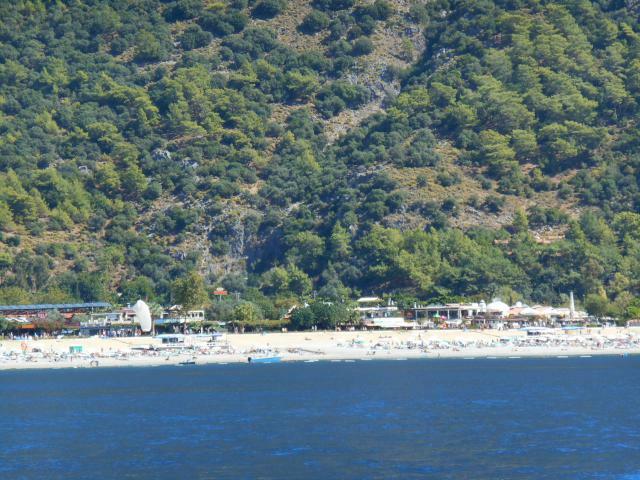 Oludiniz is one of the most photographed beaches on the Mediterranean. 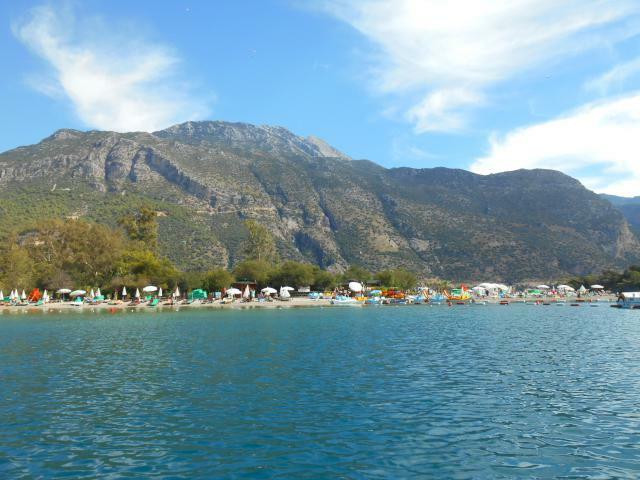 It has a secluded sandy bay at the entrance.The beach itself is a pebble beach. 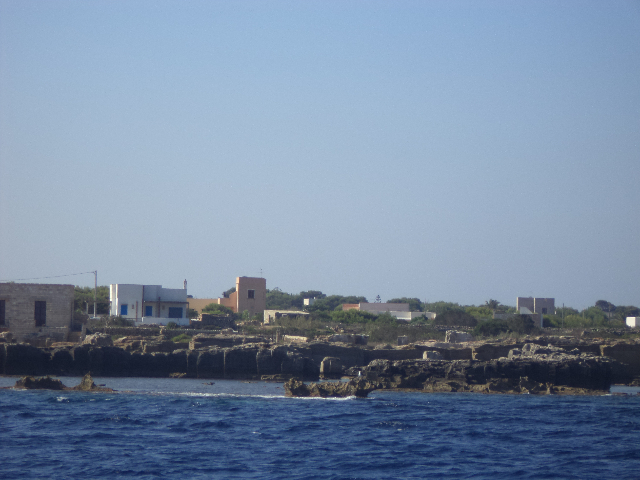 The lagoon is a national nature reserve with no dinghies with outboards allowed. Kayak came in handy. 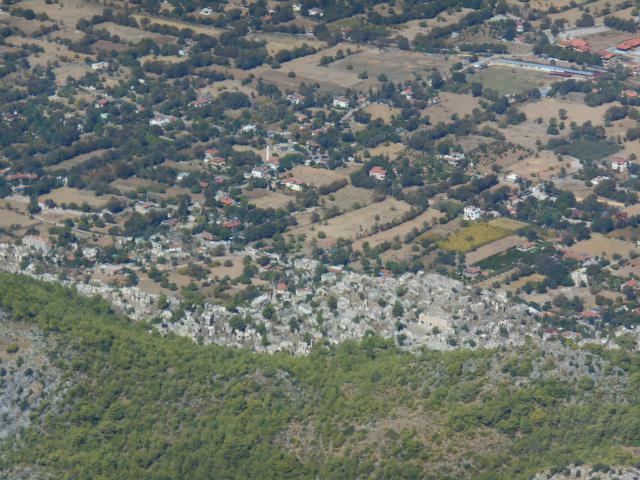 The gray stone houses you see here is the abandoned city of Kakakoy. The ghost town. The Greece-Turkey war 0f 1919-1923. Lots of blood shed and due to some treaty all inhabitants of this town on the slopes were displaced. The population of about 20,000 were forcibly sent to Greece, leaving the country troubled to find housing for all. 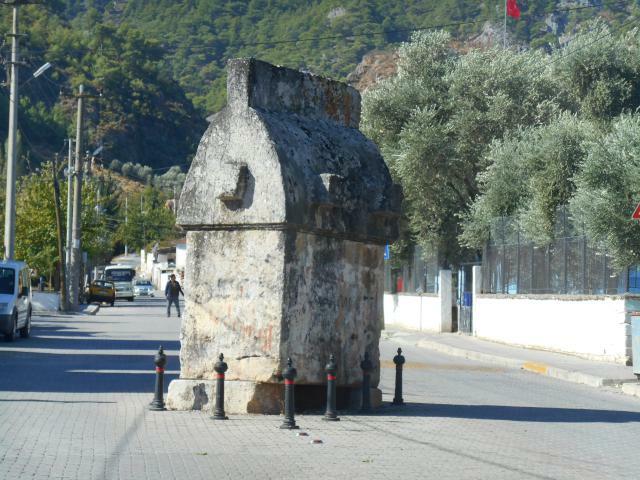 The Turks did not want to live in the slops, they were mainly farmers and set up home down in the rich plains, leaving about 3000 homes in the slopes. It’s like an open air museum. 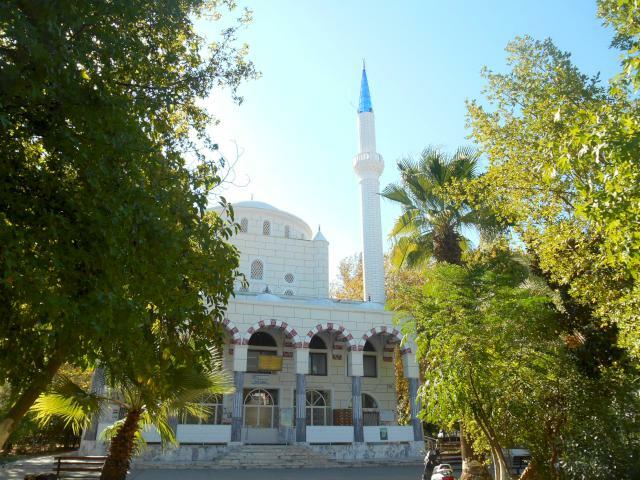 There are still about 500 houses in ruins, and under protection of the Turkish government. 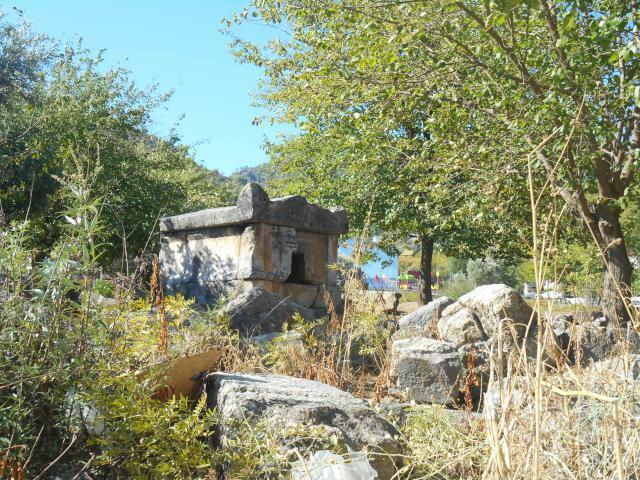 In 1957 the village suffered great damage from an earthquake. 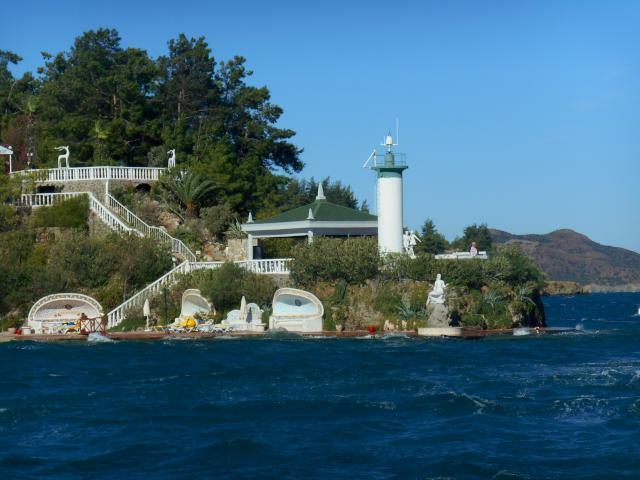 It not very attractive, really, Noel and I hiked there, but it remains as very popular destination sight for tourists. 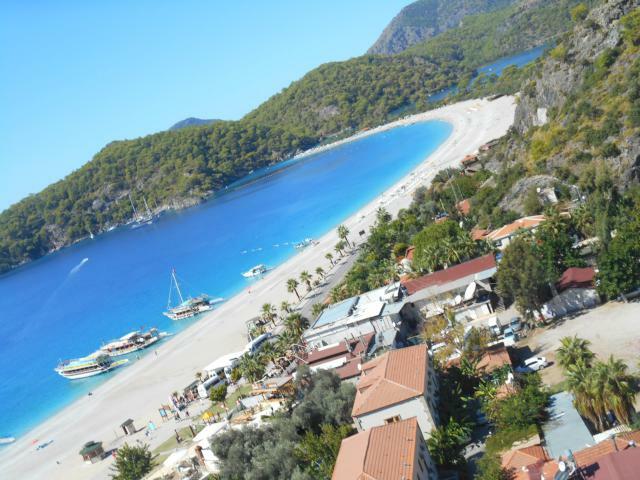 Especially because is a short bus ride to Oludeniz and Fethyie, main tourist destinations. 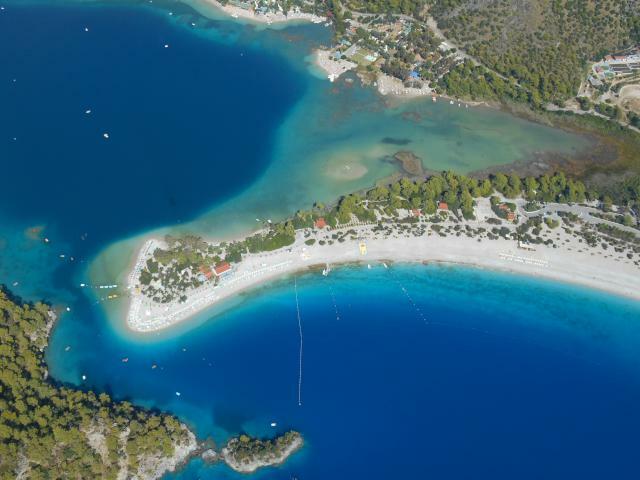 The Blue Lagoon and the surrounding resorts and hotels at the end where we kayaked. The far away island is the Greek island of Rhodes. Our anchorage. 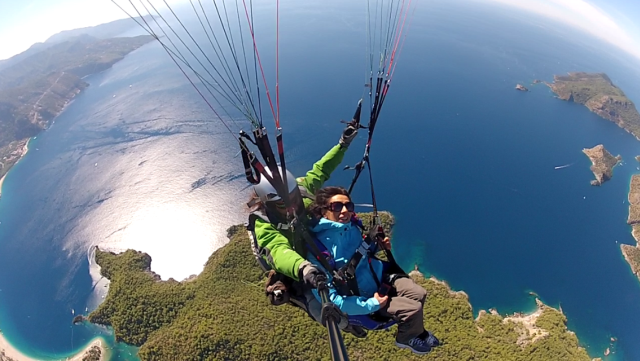 Gliding above our home. Life Part 2 is the 4th boat from the bottom. The big ones are the Gulets. I was taking photos till the last minute, and this was my last one as I was about to land. 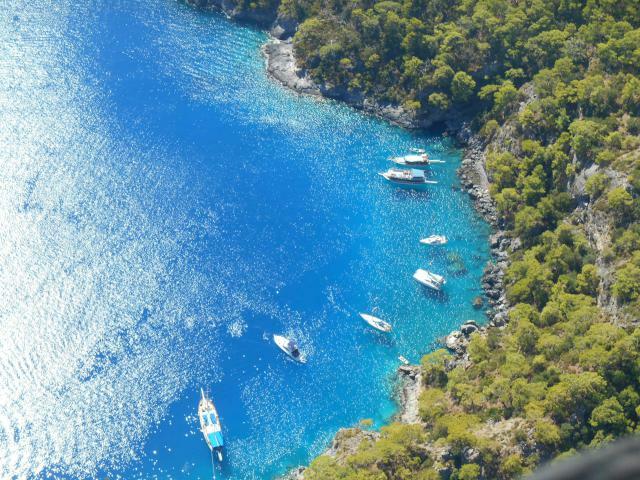 The photos bellow were taken by my pilot. I am getting ready to take a photo of our home at anchorage bellow. 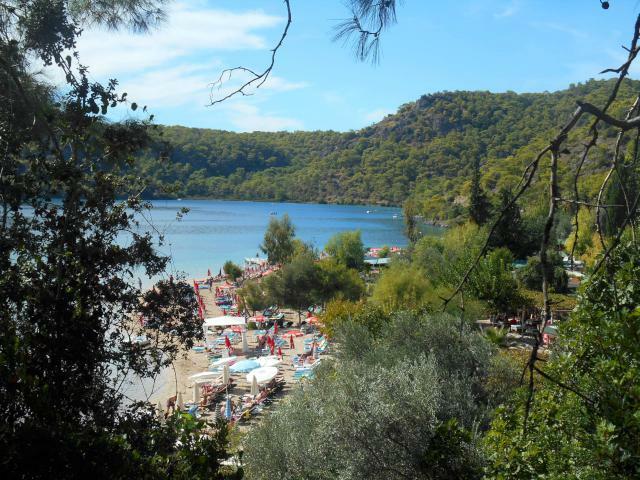 Becekiz, one of the most photographed beaches in the Med, and of course the world famous Blue Lagoon. Noel awaits! He arrived before me. And that was the last adventure on this blog post! 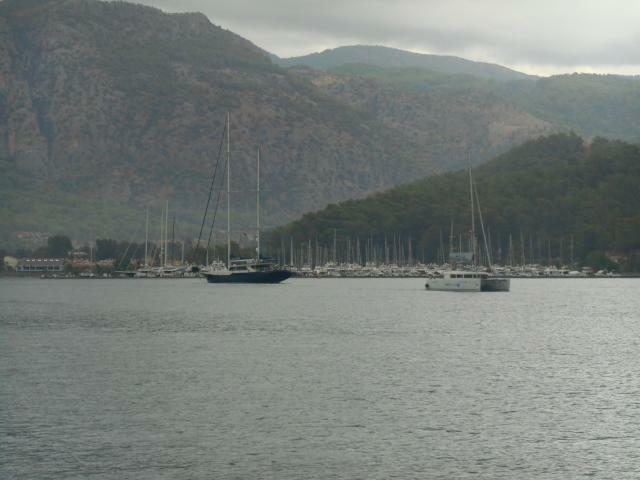 It is sad to say our sailing season is almost over as we will be getting into the marina in Finike soon. 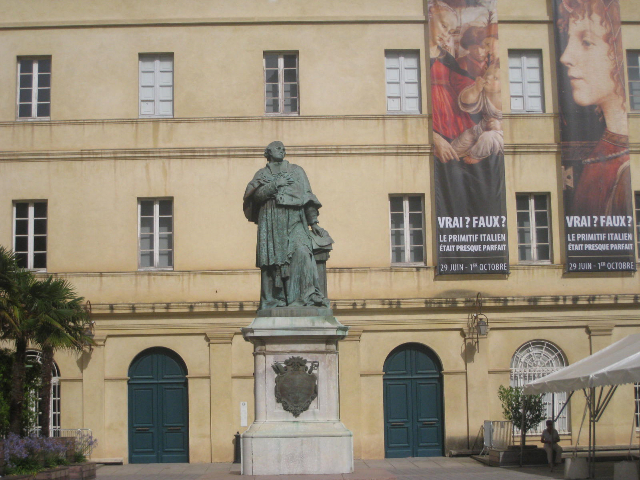 Wow Ceu- I am so glad I take the time to read your blogs and look at the photos. The ones you took while up in the air are phenomonal! 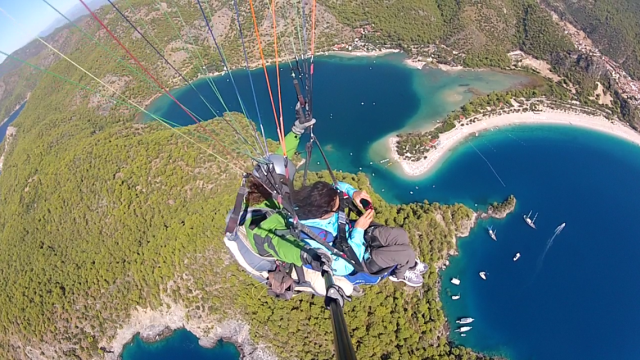 don’tknow if I could do the parasailing part though. Wow Ceu. I am so glad I take the time to read your blogs and look at your photos. 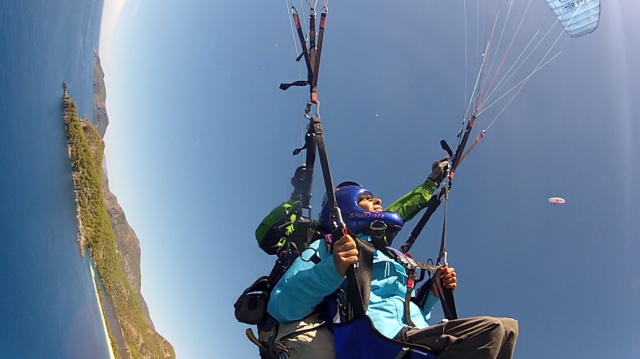 The ones you took while gliding are phenominal! Not sure I could do the sailin way up there though. this is the best blog yet. the photos are amazing. 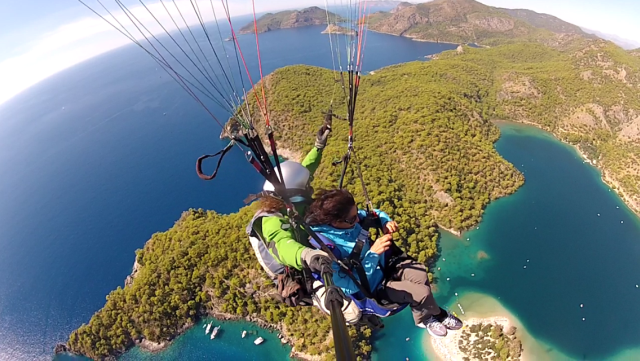 I never went paragliding. It was one adventure I missed. I was signed up to go off a ski slope (on skis), but the wind came up in the wrong direction and it was cancelled. 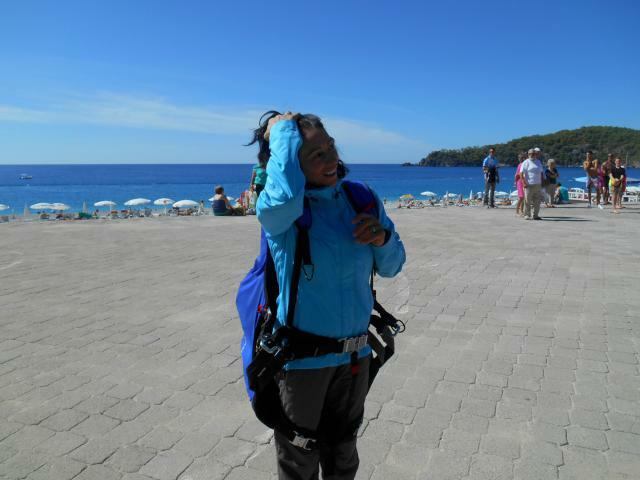 It was my last day at the resort and I missed my last afternoon of skiing, waiting to go paragliding!! This was certainly a great way to end the season. We are impressed, you guys are awesome!! !